Sun Kissed | Ooh, my favorite! I was so over pressed powder blushes. Even with the lightest of dustings I just felt like the powder looked cakey and dry, so the natural blushy glow I wanted was just not going to happen. I swear every morning I had flashbacks to the severe blushlines of the 80’s. I knew I needed a cream blush, but also knew that it couldn’t be shimmery…another decade-specific cosmetic downfall, but this time from the 90’s (glitter anyone?). So really with very little effort I came across my new-absolute-favorite blush from Josie Maran Cosmetics. It’s so lovely and effortless looking it’s precisely what blush is intended to look like: creamy with a light, natural glow (NOT shimmery). For me it’s really long-lasting but I feel like this is one of those features that differs from skin type to skin type. I only ever wear tinted moisturizer on my face so the Argan oil in the blush pairs perfectly with my oil-free Tarte tinted moisturizer. I’m wearing all of these in the picture I shared before. It really is just a nice spring/summer look. 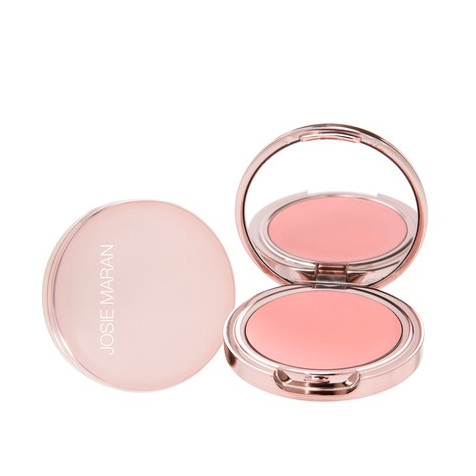 Josie Maran Cream Blush in Sun Kissed $22.